Beth and I had an early pick up of 7:40am for our trip to Champagne country, which we could have missed given my alarm didn't go off on time, but out the door we flew with excitement for our first trip to the land where you can legally call the bubbly drink "champagne." Trong picked us up with 6 other people from Australia, Singapore and Chicago and off we went in our little mini van 90 minutes north east of Paris. Our first stop was the Grand Cru town of Verzenay, where several of the big producers grow their grapes, including Roederer's Crystal and Veuve Cliquot. Stepping out of the van, the climate was considerably cooler than in Paris, which is good news for the grapes, but also makes for a sensitive and specific growing and picking process. The vines are lower to the ground to capitalize on the heat from the earth, and they're hand spread between wires to allow for maximum sun exposure and minimal impact from humidity. We began our tasting at a small producer in Verzenay called Jean-Claude Mouzon, a fourth generation family owned operation where they pick their own grapes as well as press and blend their own wines, which can be rare for someone of their size given the cost of the press at 200,000 euros. For that reason, they sell some of their grapes to keep cash on hand. They don't need to sell any of their 15,000 bottles outside of their little garage because they always sell out from people who have been buying their wines for generations. While we were there a few strolled in with their dogs to taste and load up on a few cases. After tasting their clean, smooth champagnes at very reasonable prices, I started my own case as well. I'd like to say a bottle or two might make it home at the holidays, but no promises! We had a lovely 3 course luch in the bustling town of Reims where we were dropped by Trong and told that it's best not to drink so we'd be in good form for our other champagne house, but that wasn't possible for some of us so, including those of us drinking in the name of research. I think Trong was looking to sober us up after lunch so we received a thorough tour of the cathedral in Reims, modeled after Notre Dame. A fire destroyed the cathedral in 1211, but it's been rebuilt with one of the original stained glass windows remaining, along side some newer windows designed by modern artists, causing quite a stir with some of the more traditional locals. After our history lesson, it was back to the bubbles, and we were going to one of the big producers, Taittinger. We joined a large group and descended down many stairs to the cellars, which are made of chalk, the winning ingredient in producing, as well as storing champagne. The chalk was dug out in the IV century, and turned into a crypt and then a chuch in 1211. 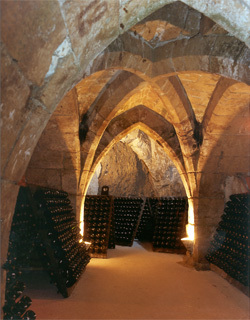 The monks went to work after and created passageways and additional rooms for wine storage as we see it today. The cellars were a pristine web of areas to store Taittinger's prized Comtes de Champagne Blanc de Blancs cuvee. After tasting their lower brow, fruitier Taittinger Brut, I opted for a champagne stopper in the unlikely event I don't finish one of my new champagnes from Jean Claude Mouzon. The van was all head back, jaw dropped snoozes on our return to Paris. A lovely day and introduction to the champagne of Verzenay and Reims, but I'm already hungry for more! thought I saw "Chalk Talk"